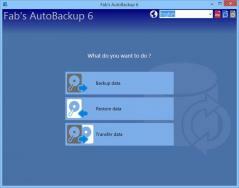 Fab’s AutoBackup is a reliable application that allows you to backup and restore important data and Windows settings. Besides data backup, the tool also enables you to backup desktop and quick launch toolbar shortcuts, Windows folders such as My Documents, My Music, My Pictures, and My Videos. You can also use it to save Internet Explorer favorites and browser profiles from Chrome, Firefox, Safari and Opera. On top of that, Fab’s AutoBackup can be used to backup email data as it provides support for Outlook and Mozilla Thunderbird clients. The program is also capable of saving Windows utilities such as network adapter settings, modem parameters and system fonts.